Collecting Justice League and Justice League Unlimited into one package really adds some perspective to it all. Having the entire show together in a single release, packaged in a very handsome tin, really shows the scope of the series, as it simply explodes from the very first episode of Justice League to the last installment of Justice League Unlimited. What started out as a considerably shy series, mostly playing it safe, took grander and grander risks with each successive season, ultimately becoming a series of true epic scope. In this action-packed adventure series, the world’s greatest superheroes, including Superman, Batman, Wonder Woman, Green Lantern, The Flash, Hawkgirl and Martian Manhunter, join forces as the Justice League to battle powerful villains, supernatural creatures and evil entities determined to take over the world and destroy the League. This set features all the bonus material and episodes from the previous Justice League DVD season collections included with new extras! 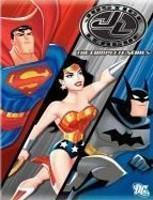 Crack down on evil with the new Justice League: The Complete Series DVD collection! Like many, the first season of Justice League didn’t grab me like the previous efforts by Bruce Timm and his creative team. It was obvious they were still working a lot of kinks out when it came to creating worthwhile two-part episodes, using the ever-evolving new computer technology, and just learning how to successfully write a team show. After focusing on superheroic solo adventures, save for the handful of team-ups from their previous series (like Superman: The Animated Series, Batman: The Animated Series and Batman Beyond), it was a noticeable adjustment for the creative team, but one they really got the hang of in the second season of the series. That, my friends, is when Justice League just took off and kept on going up and up. The first episode of Justice League’s second season was like an utter rebirth, and it just got better from there. Now, like my Batman: The Complete Animated Series DVD collection review, my overview of the series will be brief. I’m sure fans are more interested in the DVD release itself, so I’ll wrap up this segment of the review as quickly as possible so readers can get on to what they really want to see – the collection itself. The show isn’t flawless, let’s not kid ourselves. Both Justice League and Justice League Unlimited had the odd underwhelming episode here or there, but the overall quality definitely overpowers any occasional slip. Plus, as the show went on, it was obvious that, almost episode to episode, the creative team were improving upon previous mistakes. Just compare first season episodes of Justice League to second season episodes, and then look at how that all changed with Justice League Unlimited, building up to the expansive and undeniably impressive multi-part “Cadmus” arc. The creative team was re-inventing the wheel over and over again, it seems, and rarely getting a flat. For fans of DC Comics, I truly cannot see how anyone could walk away disappointed in this series, especially as it enters the Justice League Unlimited era. Got a favorite hero who is not a member of the core seven? Well, there’s a good chance that particular character got screen time in one way or another during the last 39 episodes of the series. When the super hero world opened up in Justice League Unlimited, it resulted in a plethora of new characters, but the focus never drifted from the core seven. In one form or another, the original Justice Leaguers remained just as important, even if they made only a minor role or were never seen. Their influence remained, never wavering from the first episode to last. This series managed to escalate events season to season without ever drifting away from the core concept of what Justice League. The concept evolved and grew, yes, but it still remained, much to the credit of the remarkable creative team on this series. It’s a truly epic series in all points of the word. Sure, it had a slow start and the odd bump here and there, but this is just a fantastic series overall. As James Tucker says in the new “Unlimited Reserve” bonus feature included in this collection, they may not have set out to make the best animated superhero show to date, but arguably they did. Surprisingly mature but still accessible to the younger crowd, shockingly complex but easy to pick up, Justice League was a treat for the both the die-hard fan and new viewer. There’s just so much to munch on here, be it the amazing animation, solid story-telling and complex characters. Not every episode is a homerun, but those truly pale in comparison to the rest which just knock it so far out of the part. This right here is how you make a team show, but I doubt anyone is going to be able to top the work on Justice League any time soon. Justice League: The Complete Series, collecting Justice League and Justice League Unlimited into one package, definitely comes Highly Recommended. Now this is one snazzy tin collection. Warner Home Video has created a great looking package here for the Justice League: The Complete Series DVD collection, one that will undoubtedly be hard to miss on the shelves. A solid collection repackaging the original Justice League DVD volume releases, the durable tin container groups together two sturdy double-wide Amaray cases, cases which house the 15 included discs. The two double-wide transparent Amaray cases are identical to the cases used in the Batman: The Complete Animated Series collection released last year by Warner Home Video. Naturally, the seven main Leaguers adorn the tin container. Digging in, the first Amaray case holds eight discs, featuring Justice League episodes, and a simple insert, while the second case holds seven discs, Justice League Unlimited episodes and a bonus disc, plus the insert. Inserts contain a rundown of the included episodes. Given this collection is essentially a repackaging, each disc is identical to the ones released in the previous Justice League/Justice League Unlimited season DVD collections. That means that, yes, any problems and issues that were found on the previous releases are repeated here. Flubbed audio in the Justice League Unlimited episode “Divided We Fall?” Check. Episode order mix-up between “Question Authority” and “Hunter’s Moon?” Check. But still, don’t let those past mistakes dampen what is a really solid collection. All the previous bonus content is here, too. In essence, if you bought the previous season releases, then you have everything here and know what to expect. Everything except for the new bonus disc included (and the great packaging, of course). Much like Batman: The Complete Animated Series, Warner Home Video has tossed in some additional bonus material to lure those impressionable consumers into a double-dip. The bonus disc contains the new featurette “Unlimited Reserve: A League for the Ages.” Running nearly 17 minutes, a fine length, the featurette covers the entire history of the Justice League animated series, even touching upon the previous Superfriends efforts. Lots of familiar faces pop in to recall working on the series, their personal highlights, etc. It’s a suiting retrospective for the Justice League animated series, emphasizing just how this show managed to work so well in its 91-episode run, even if many of the talking points are rehashed. The bonus disc wraps up with a host of trailers. To return to the Justice League Unlimited episode “Divided We Fall” for a moment, a glitch-free version of this episode is available on the Superman/Batman: Public Enemies animated feature Blu-ray release. More details on that title and release can be found at The World’s Finest with a review available here at The WF DVD Report. And that is essentially it for this release. Given that these discs are the exact same as the previous releases, just repackaged in a swanky new tin collection, there’s really nothing in terms of audio and video that we haven’t already seen. For a more detailed look at the individual specs for the Justice League and Justice League Unlimited season releases, included in this collection, check out the Justice League subsite here at The World’s Finest. Personally, it would have been nice for Warner Home Video to go back and fix any errors from the original releases and even upgrade some of the widescreen video transfers. Still, Justice League: The Complete Series is a great collection to own. Those double-dipping may want to question the merit of essentially spending a big chunk of change for a new featurette and (admittedly awesome) packaging, but newcomers should jump on the opportunity to pick this up. Justice League started out as simply a good show that, along the way, evolved into a series of epic scope. There’s no denying that this series is truly the diamond in the DCAU crown. This collection neatly ties a bow on Bruce Timm’s animated rendition of the DC Universe, effectively wrapping up a stunning piece of animated work. Personally, especially with the holidays around the corner, I definitely Recommend this extensive release. A great overall collection, both in content and presentation, Justice League: The Complete Series is the pinnacle of DC Comics-based animation and wildly deserving of a spot on anyone’s shelf. Justice League: The Complete Collection is now available to own on DVD.